? via GIPHY 1. 53% of marketers report using interactive content (2) 2. 93% of marketers agreed that interactive content is effective in educating its buyers versus just 70% for static content (3) 3. 88% of marketers said that interactive content is effective in differentiating their brand from their competitors (4) 4. 63% said they use interactive content to educate their audience (2) 5. The number of interactive posts has increased by 33% (1) More and more marketers are feeling the pressure to create new experiences for their target audience in order to stand out from the crowd. And interactivity offers them a way to do that, causing interactive content marketing to rise in popularity.
? via GIPHY 9. 79% of marketers said that combining interactive content with other content marketing tactics increases message retention (2) 10. 79% of marketers said interactive content can be reused a lot, leading to repeat readers (2) 11. 75% of marketers said non-gated interactive content offers a sample of the brand and nurtures leads (2) 12. 68% of marketers said interactive content makes it easy to repurpose passive content (2) 13. Interactive content generates 2x more conversions than passive content (5) So how good is interactive content at doing all of the things it promises to do? According to the reports cited above, it does a pretty good job. Improved message retention? Check. Reusability? Check. Nurtures leads? Check. And, once you have the interactive technology, the opportunity is there for you to take your static content that already exists and make it interactive, improving productivity and efficiency. ?? via GIPHY 14. 54% of marketers use interactive assessments, making it the most common type of content (2) 15. The top five most effective types of interactive content for the top of the funnel are: contests, games, quizzes, interactive infographics, assessments (2) 16. The top five most effective types of interactive content for the middle of the funnel are: calculators, interactive white papers, interactive eBooks, interactive lookbooks, wizards (2) 17. Interactive content is most commonly used on landing pages, social media platforms, microsites, and blogs (2) 18. The most effective type of interactive content for the bottom of the funnel are configurators (2) 19. Virtual Reality (VR) and Augmented Reality (AR) traffic will increase 12-fold between 2017 and 2022 globally (6) Interactive content has widespread applications that do more than making a quiz or calculator. In fact, AR and VR are two landscapes where interactive content can thrive, and it’s rapidly growing. There are a number of different assets and experiences you can create thanks to interactivity and its functionality. For example, just this past year we used interactivity to create a multi-media microsite for our client, Prophix. 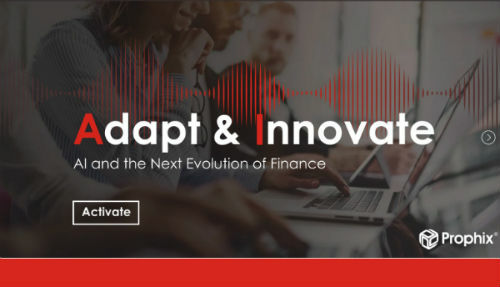 To educate our audience on AI and the future of finance, we created a simulated voice assistant (a la Siri or Alexa) to “host” our expert influencers in AI and finance as users navigate through the microsite experience. The result? Our CEO Lee Odden summed it up in a recent post: “The combination of interactive experience, voice and text content, relevant finance and AI influencers plus brand thought leadership resulted in a record-setting engagement.” For more ideas on what you can create with interactivity, check out these cool interactive content ideas. As my colleague, Josh Nite, recently shared: “Interactivity isn’t a substitute for quality, just a supplement.” While interactive content is a solid investment for B2B brands, helping them differentiate their content marketing, the level of quality still has to be high. If your content doesn’t provide value to your audience, no one is reading it – regardless of interactivity. But if you’re able to create high-quality content that resonates, and enhance it with interactivity, that’s the ticket to rising above the competition, creating deeper engagements with your target audience, improving message retention, and more. Registration and complete B2BMX conference details are available on the official event website. 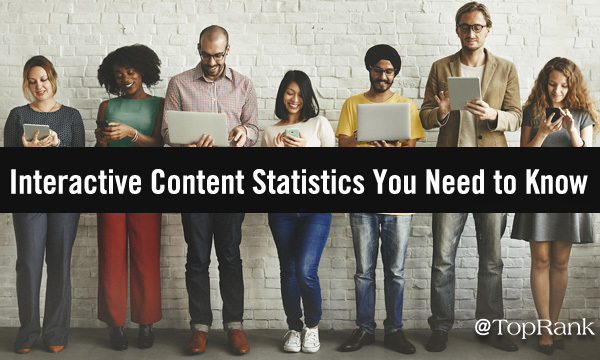 The post Embracing Interactive Content: 19 Statistics Every B2B Marketer Needs to Know appeared first on Online Marketing Blog – TopRank®.